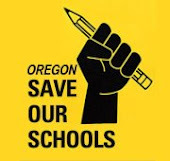 Yesterday Oregon Save Our Schools member and co-founder Joanne Yatvin had this article published in Literacy and NCTE, the official blog of the National Council of Teachers of English. She is NCTE's P12 policy analyst for our state. A few days ago, I read an article about education that really irritated me. Although I’d read similar articles before without any reaction, this one was about a plan for schools in our state of Oregon that sounded wrong-headed to me, and was going to cost 3.5 million dollars a year. According to the article, the Oregon Department of Education and the Chief Education Office have devised a plan that would deploy a team of “on-the-ground experts” to help schools that have a record of severe student absenteeism. That team would be composed of 20 coaches who would receive training, then be placed in selected schools to work on alleviating the problem. What I saw was another top-down pipe dream, welcomed by school principals who had been unsuccessful in curbing absenteeism themselves, and meant to be implemented by newly hatched experts called “coaches.” Teachers and parents of chronically absent students would be informed about the new plan and asked to cooperate. The only people left out would be the ones who know the most about the causes of student absenteeism and how to reduce them: students. My argument this time is the same as it has been in regard to other school problems: students should be active players in the planning and execution of any change in school operations—not only because they have firsthand knowledge of the problems and clear views of the causes, effects, and possible solutions, but also because their cooperation is essential if anything positive is to be achieved. Joanne also spoke to the lack of student input into policy directly affecting students on her own blog, The Treasure Hunter, last month. Many thanks to Joanne for her long history of speaking up for students and encouraging policy makers to listen and allow students to speak up for themselves! OSOS is proud to have Joanne as a member and we are incredibly grateful for her leadership.